At the end of the 19th century Denver was reaching the half-century mark. 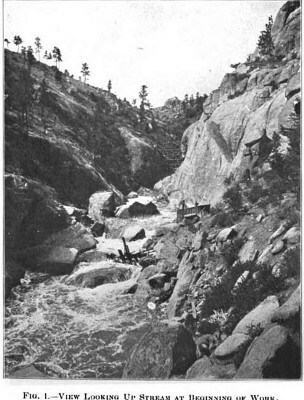 By 1900, the former mining camp founded in 1858 at the confluence of Cherry Creek and the South Platte River had grown to 130,000. 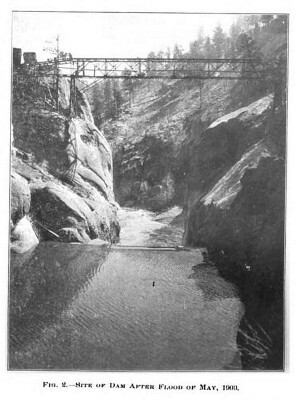 Denver’s early efforts at providing safe and reliable water first depended on water taken directly from the river and creek. 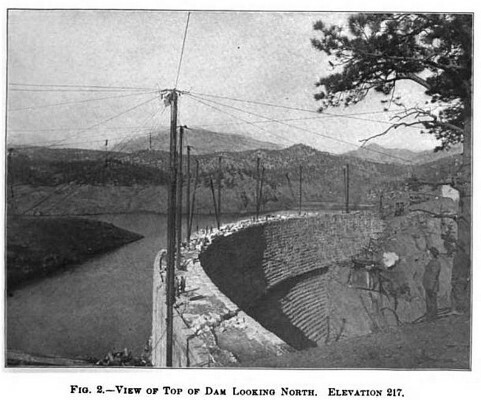 Later, canals brought mountain snowmelt and runoff to the city and then distributed underground via wooden pipes and “subterranean storage cribs.” A series of artesian wells and storage lakes were constructed around the countryside nearby. 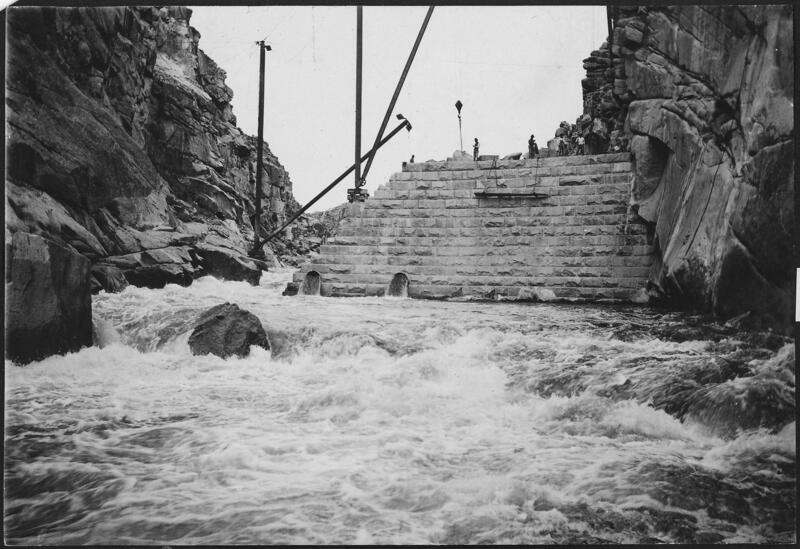 Water quantity and quality struggles and periodic flooding marked the city’s early years (floods continued to plague it until the late 1960s when a dam was built upstream on Cherry Creek). By the 1870s and into the 1880s, a number of water companies had competed with each other, eventually merged or were bought out in a protracted scramble for hegemony. 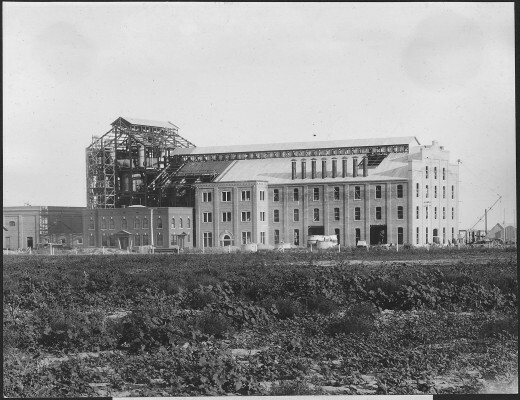 Then in 1894, the Denver Union Water Company, organized by industrialists Walter S. Cheesman and David Moffat, consolidated the last remaining water businesses under their control. Immediately Denver Union Water Company began plans to build a dam and reservoir in the mountains above Denver on the South Platte River to ensure an adequate water supply for the growing city. 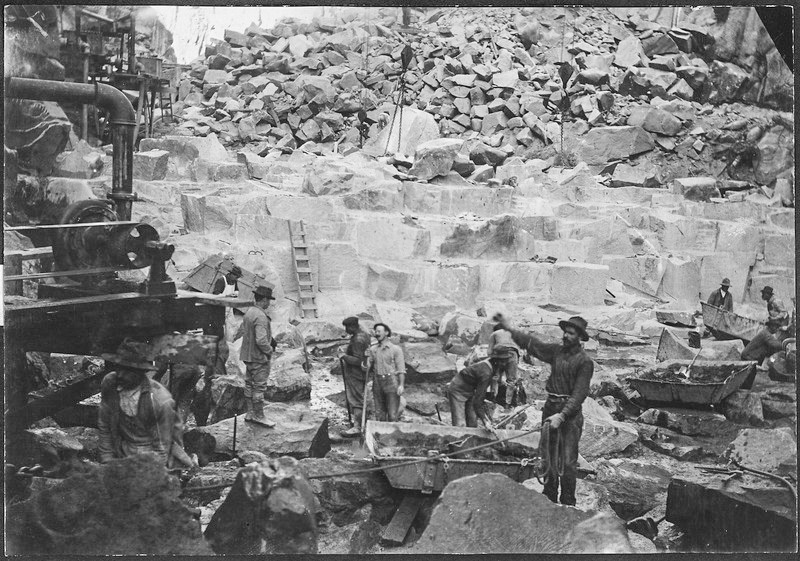 After the rights to a suitable dam location and ownership of the surrounding property that would become the reservoir was secured from the federal government, work began in 1898. The dam site, just below the confluence of Goose Creek and the South Platte, was to be a 210-foot-tall rock fill design faced with steel plates on the upstream side, basically a large flat triangular-shaped plug running perpendicular to the stream flow, which relied on gravity acting on the mass of rock fill to ensure its strength. 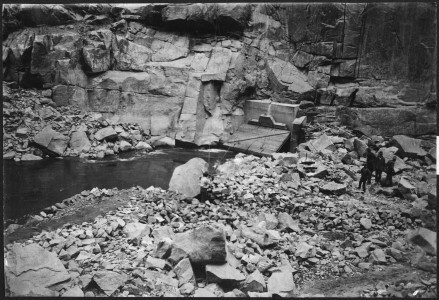 In spring 1900 when a major flood event brought a rush of high water down the canyon above, the incomplete dam was almost completely washed away and work had to be started over. 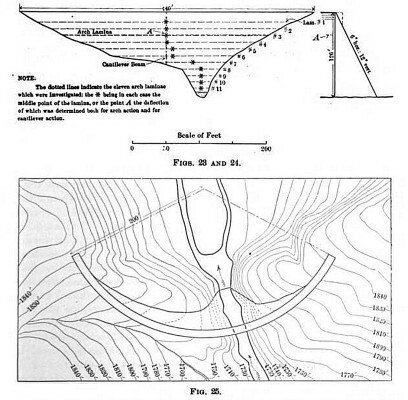 The next iteration was a design improvement that combined what remained of the base of the gravity structure with a curved arch design that deflected a portion of the stress generated in holding back the mass of the reservoir’s water outward through the wings of the arch to the canyon walls. This type of structure was considered innovative and somewhat controversial at the time. 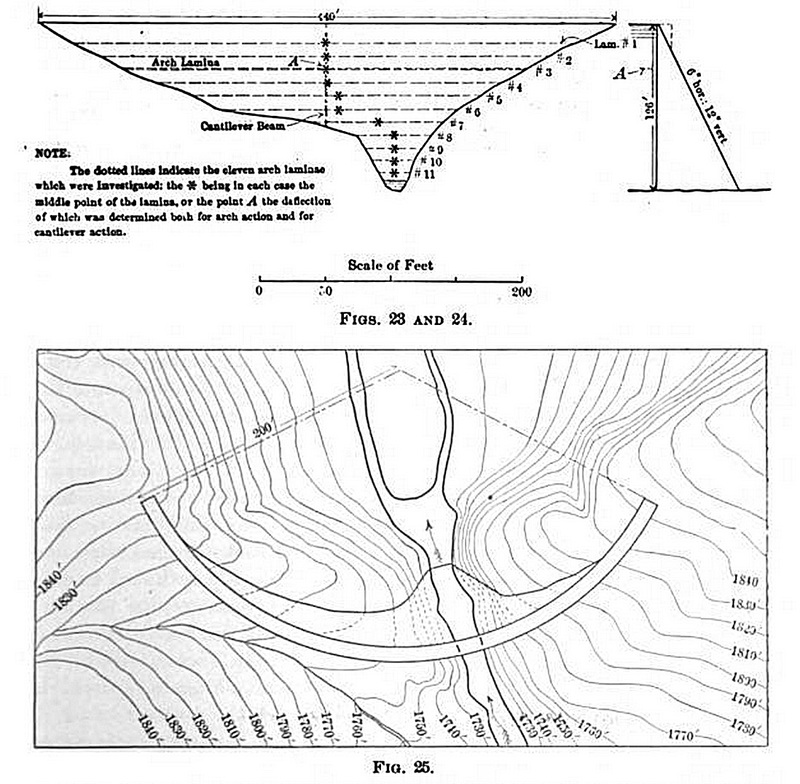 The benefits of adding an arch or bow to the dam’s profile in theory would make it possible to withstand the stresses with much less mass and thereby reduce construction costs and time. 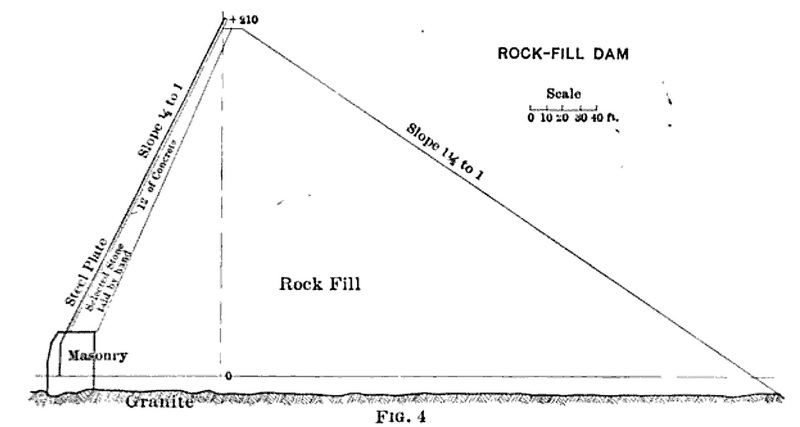 The base of the dam would remain very thick and of large mass, while the upper portion of the dam would thin out to a delicate but strong arch. Work began on the new design in fall of 1900. 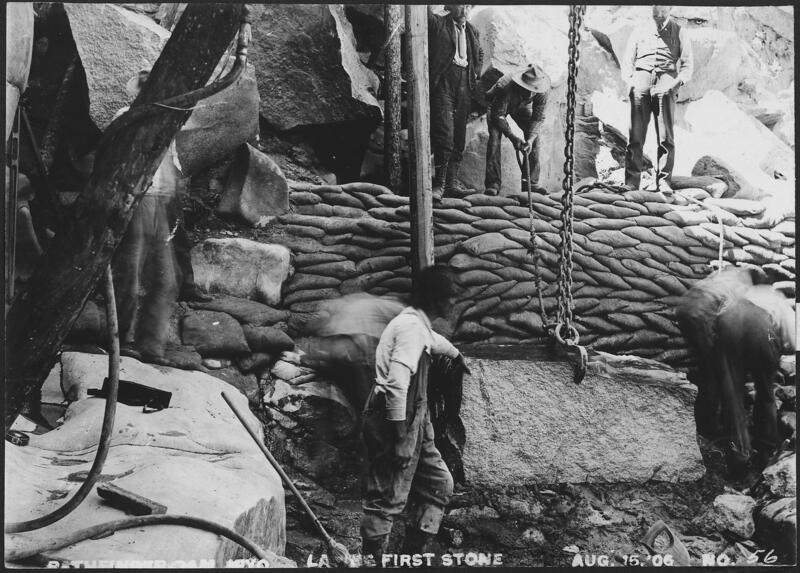 Construction required transporting massive granite blocks from quarries nearby and cementing them in place with mortar–a mixture of Portland cement, sand and rubble stones. There were two quarries onsite. One below and one above the dam. 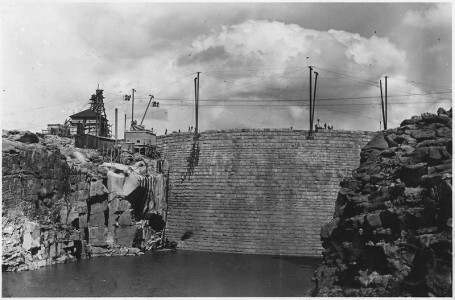 Below the dam two rail lines were built to move the stone while above the blocks were floated on barges to the rising dam as the water for the reservoir was allowed to fill behind the growing structure. In the winter stone blocks were dragged on skids on the ice of the reservoir. 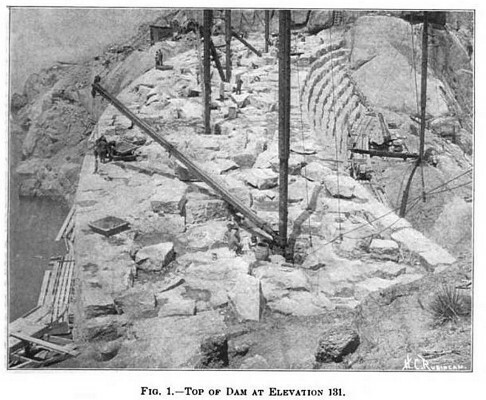 And the blocks used in the interior of the dam were purposely selected and fitted so as to create an interlocking irregular structure that would resist the seepage of water and any internal movement caused by variations in temperature from the upstream to the downstream side and, more importantly, by the deflections of the dam structure which was under tremendous pressure from the water it held back. The faces of the dam were finished with rough regular-sized blocks of the same granite quarried on site. A crew of Italian stone masons bought in specifically for the construction dressed and placed the stones. During the construction phase the dam’s engineers decided that the design could withstand the added pressures that would be caused if the height of the spillway was raised to 217 feet from the original 210 feet. When the dam was completed in 1905 it was the tallest dam of its type in the world. The structure tops out at 227 feet and is 18 feet wide at the top, 176 feet wide at the base and 735 feet long. It is curved to a radius of 400 feet. 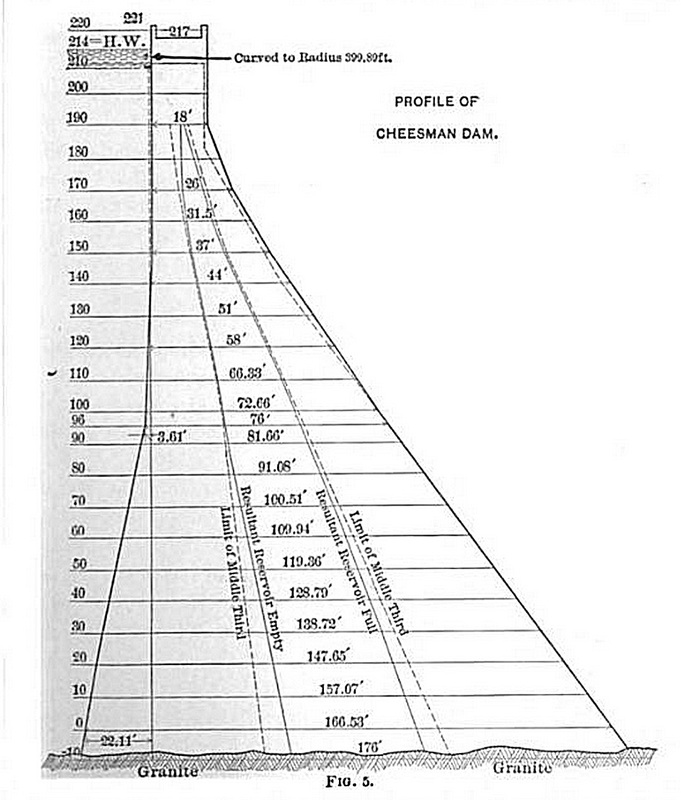 Today Cheesman Dam and Reservoir are keystone facilities in Denver’s complex water supply infrastructure. During the period that Cheesman was being constructed, plans were underway to develop a similar dam and reservoir on the north fork of the Platte River in Wyoming. Here the plan was to encourage irrigated agriculture in southeastern Wyoming and western Nebraska. 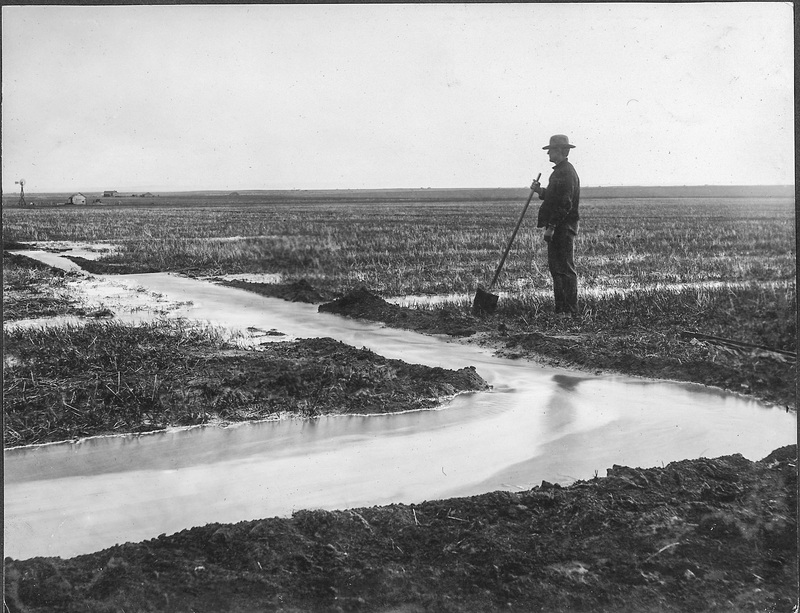 Since the 1880s farmers had tried to work the soils that bordered the North Platte, often digging ditches and creating small cooperative canal and irrigation districts. This arid region often receives very little rainfall and the growing season is short. 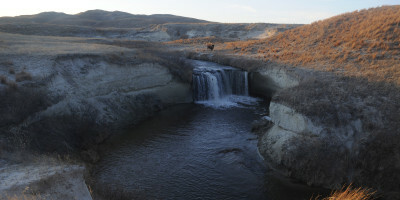 But the North Platte’s average annual flow from spring snowmelt and precipitation runoff averages more than a million acre-feet, most of that in the spring. During the extended drought years of the 1890s, local farmers and regional developers floated several plans for damming that spring runoff and digging ambitious irrigation canal systems that went unrealized for want of the necessary funding and engineering expertise. 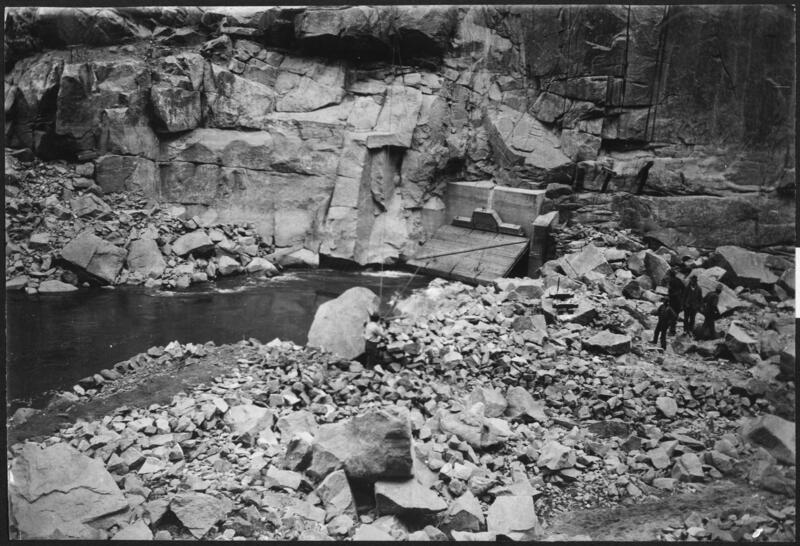 When the federal government under President Theodore Roosevelt created the United States Reclamation Service in 1902, its charge was to develop dam and irrigation projects, especially in the arid lands of the American West. One of the first places the new agency looked was the North Platte drainage. 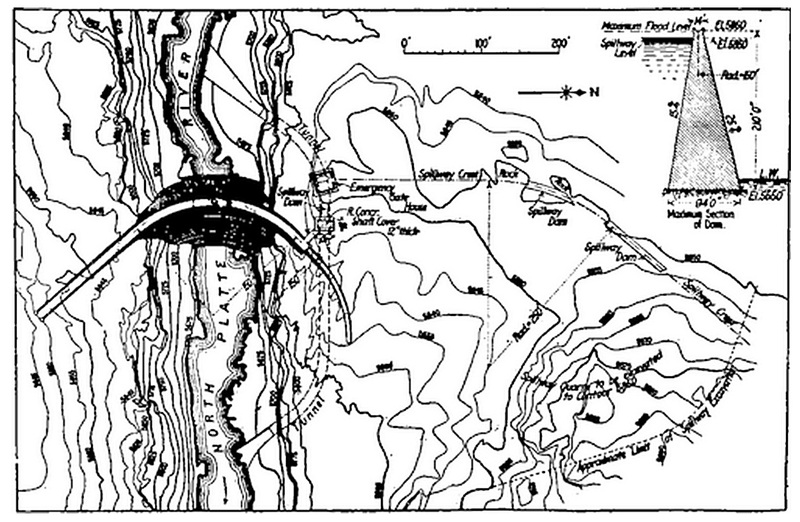 In summer of 1902, USRS survey crews went west to assess a possible dam site at Devil’s Gate, a narrow canyon on the Sweetwater River (a tributary of the North Platte) about sixty miles west of Casper, Wyoming. 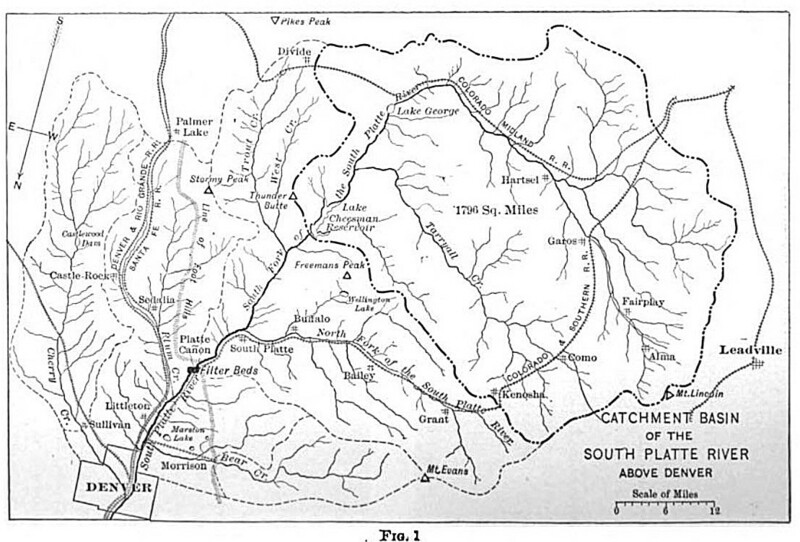 When low flows on the Sweetwater indicated a lower-than acceptable cost/benefit ratio, the Wyoming state hydrologist suggested looking at a narrow canyon on the North Platte just below its confluence with the Sweetwater. 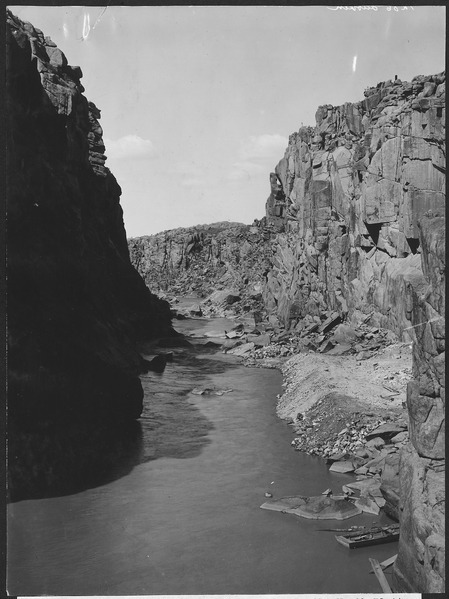 This canyon was explored by boat in 1842 during a military expedition led by John C. Fremont, who was known as “The Pathfinder” for his efforts to promote migration and settlement in the west via the Oregon and California trails. By 1905 a design had been approved and contracts let to start construction. 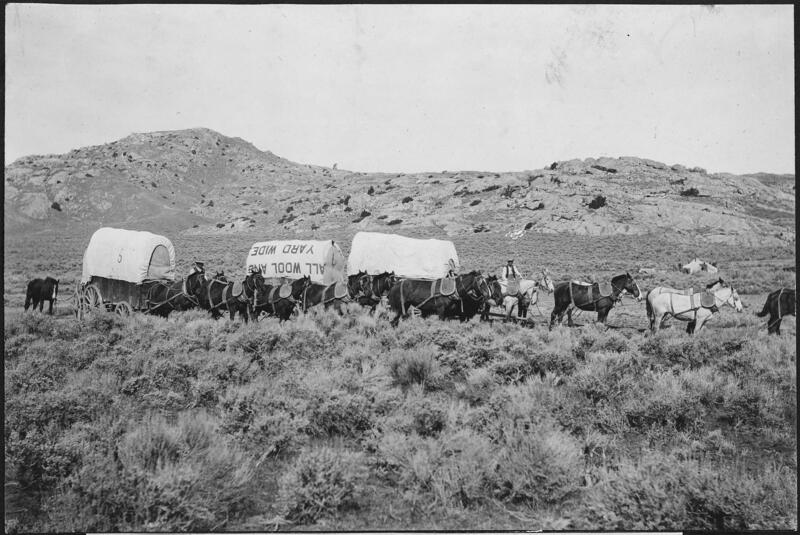 The first bidder backed out after realizing that all construction materials would need to be freighted by ox cart or horse drawn wagons over 45 miles of rugged sage desert. 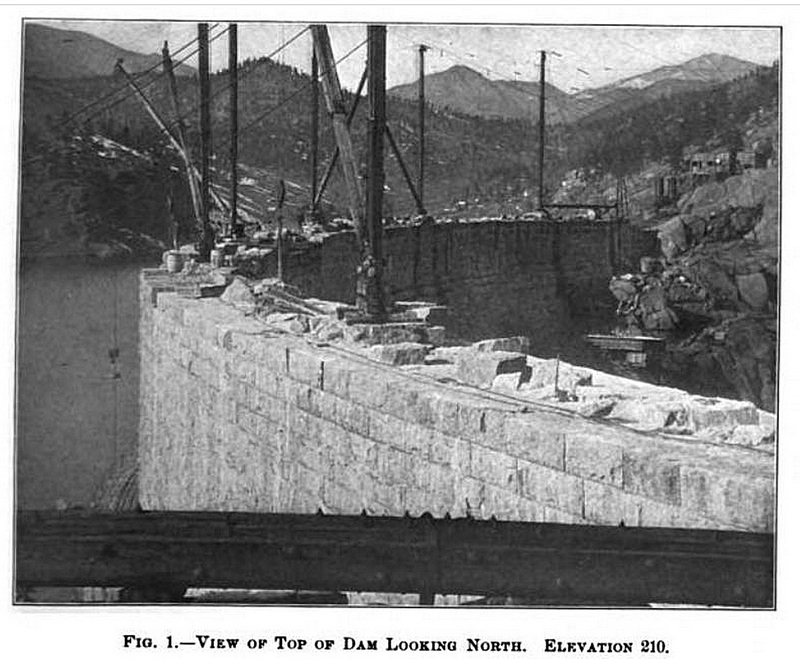 When it became apparent that the next lowest bidder didn’t have the necessary experience to complete the work, the bid was awarded to the firm of William F. Geddis and David Duff Seerie, the same Denver contractors who built the just-completed Cheesman Dam. Pathfinder was designed at the outset to be a “cyclopean masonry arch” structure very similar to Cheesman. It is 214 feet high, 97 feet thick at its base and 11 feet wide at its top. 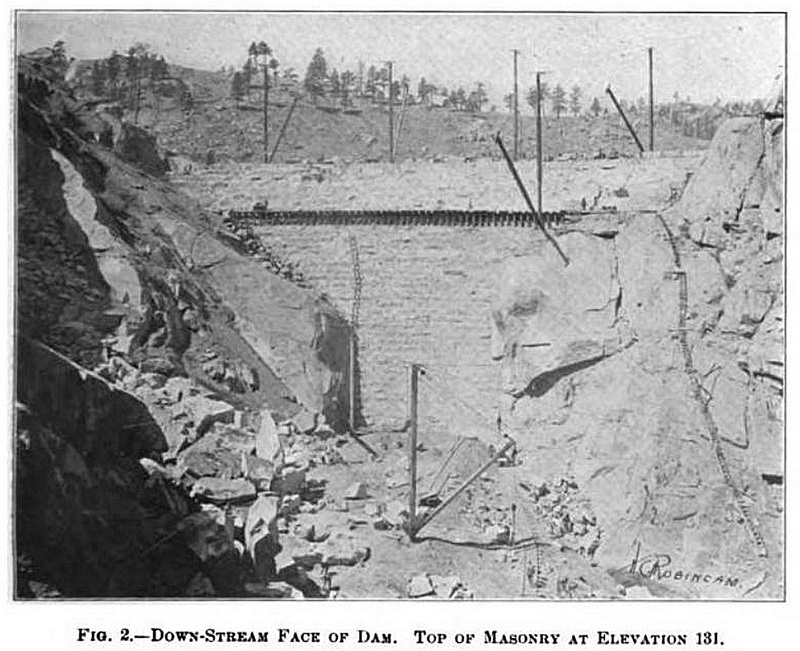 Like Cheesman, the dam is built from granite quarried nearby. Three-foot face stone in storage. Pathfinder Dam. Department of the Interior. Bureau of Reclamation. Engineering and Research Center. Construction techniques followed the path set by the same crew at Cheesman, although on the North Platte the reservoir wasn’t allowed to fill behind the growing dam and therefore rock wasn’t floated to the construction site above the dam. Rail systems were used to move the large irregular stones into place where they could be lifted by derricks and lowered into the canyon. 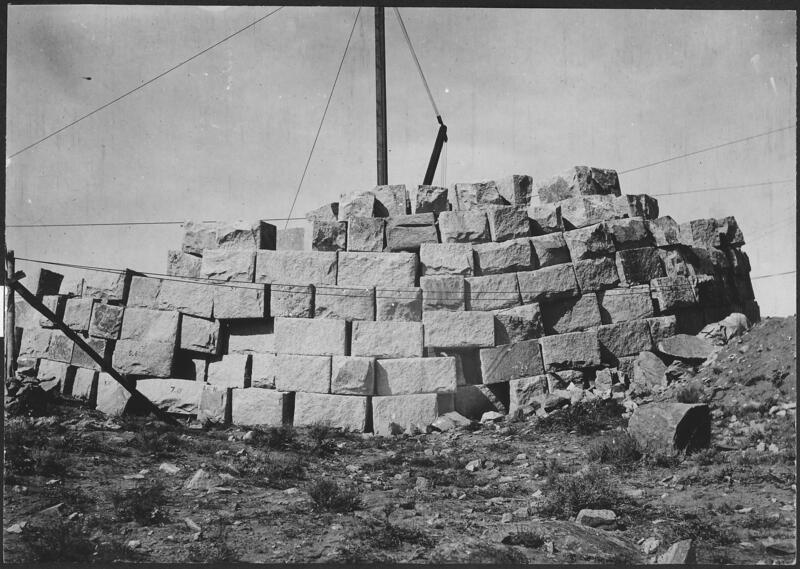 The regular shaped facing blocks were cut, finished and placed by the same crew of Italian craftsmen that finished the outer surfaces of Cheesman. 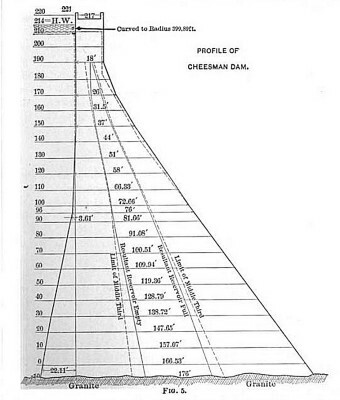 Pathfinder Dam; upper face. Department of the Interior. Bureau of Reclamation. Engineering and Research Center. 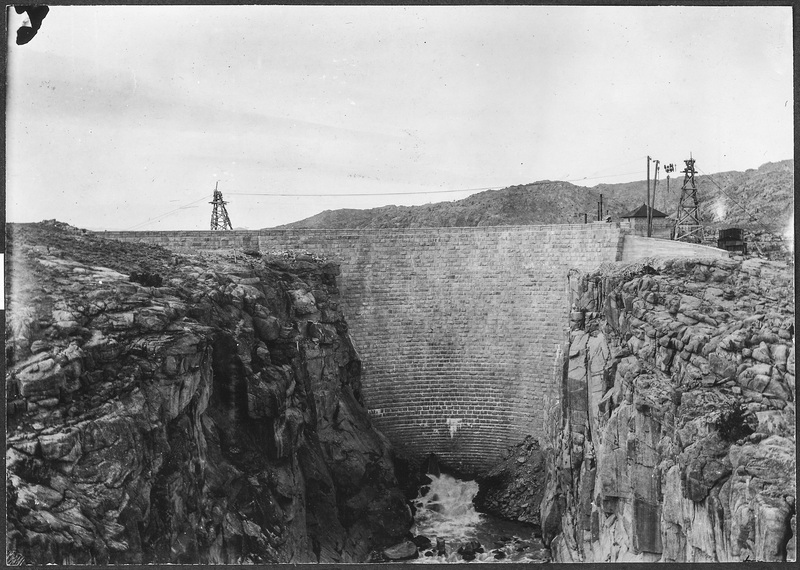 The dam held. Flows returned to normal later that summer. 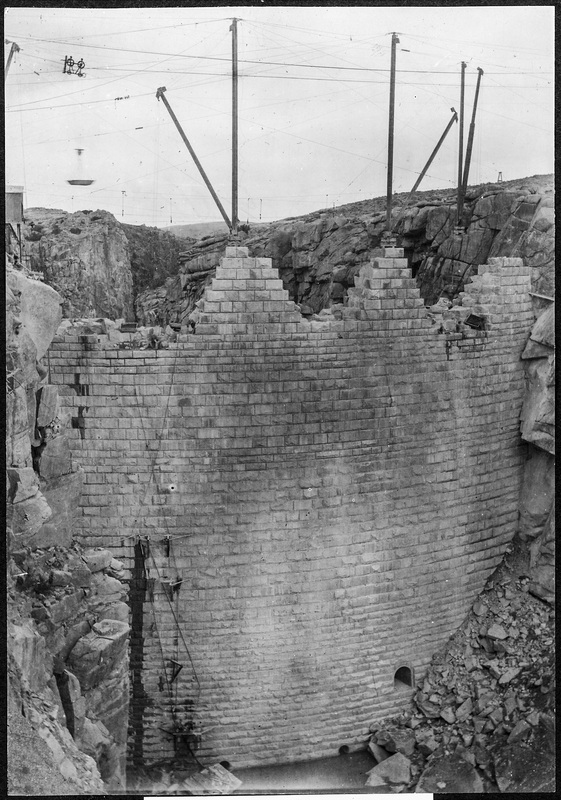 The dynamite was forgotten until 1949, when crews working on the face rediscovered it and it was very carefully removed by an explosives expert. 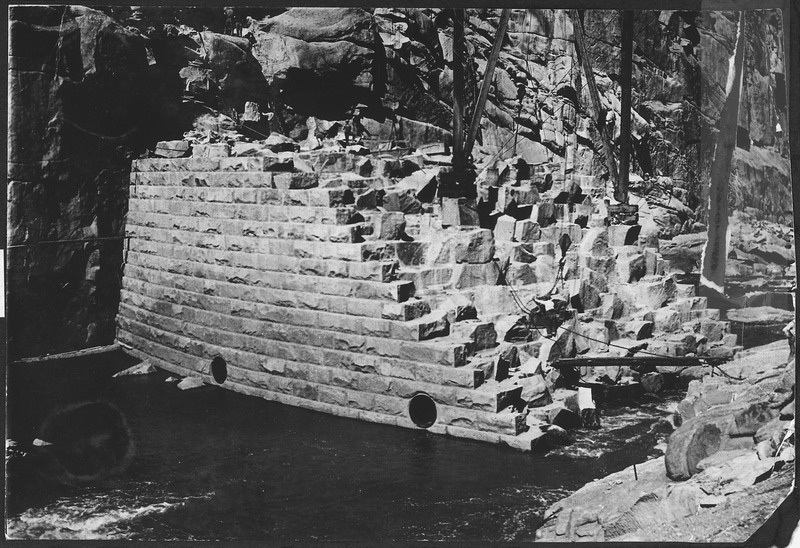 Even though many of the tools, techniques and materials used to construct these dams were similar to those used to build the great European cathedrals of the Middle Ages, when Cheesman and Pathfinder were built they were in the avant garde of dam design and construction. Engineers at the time debated the designs’ merits, risks and potential for failure. It’s hard for us today to imagine this type of work and working conditions. Mathematical formulae for determining stresses and points of mechanical failure were not sophisticated and took hours to work out using complex hand-written equations and slide rules. 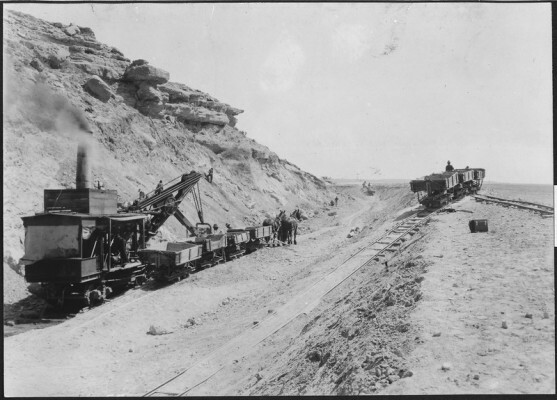 Steam engines were used for on-site power, fueled by wood harvested nearby. Thousands of tons of materials were freighted in to the remote sites using only wooden wagons and animal power. Crews comprised of hundreds of workers camped in tent villages year-round. Although the construction of these two dams profoundly altered the basic nature of the Platte River, these two structures have made possible great things. Modern Denver would not be what it is today without a stable and safe water supply. 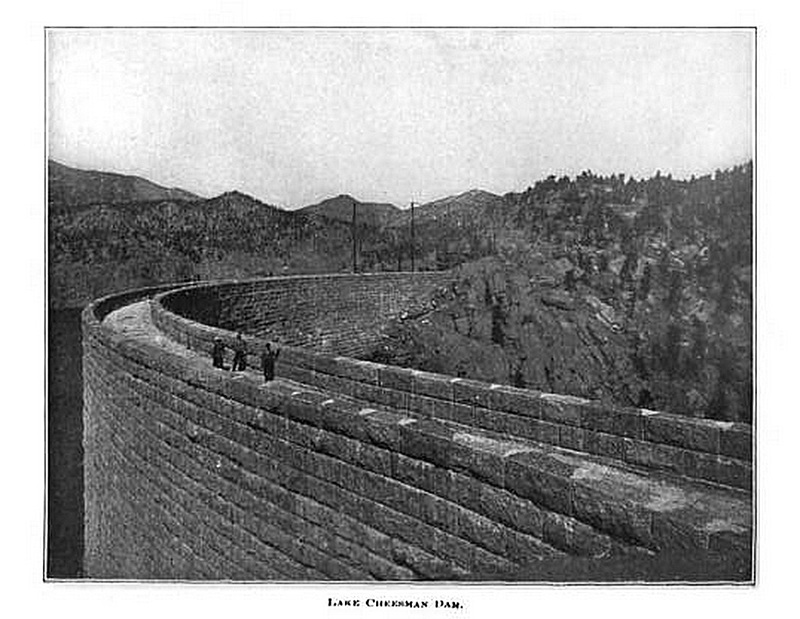 Cheesman Dam and Reservoir was the first salvo in a century of massive and complex water development projects on the Front Range. Now many more dams, reservoirs and trans-basin diversions from the Colorado drainage feed one of the fastest growing urban areas in the west via dozens of tunnels and pipes. One interesting comparison is that Cheesman Reservoir holds back only 79,064 acre-feet while Pathfinder’s capacity is 1,016,500 acre-feet. 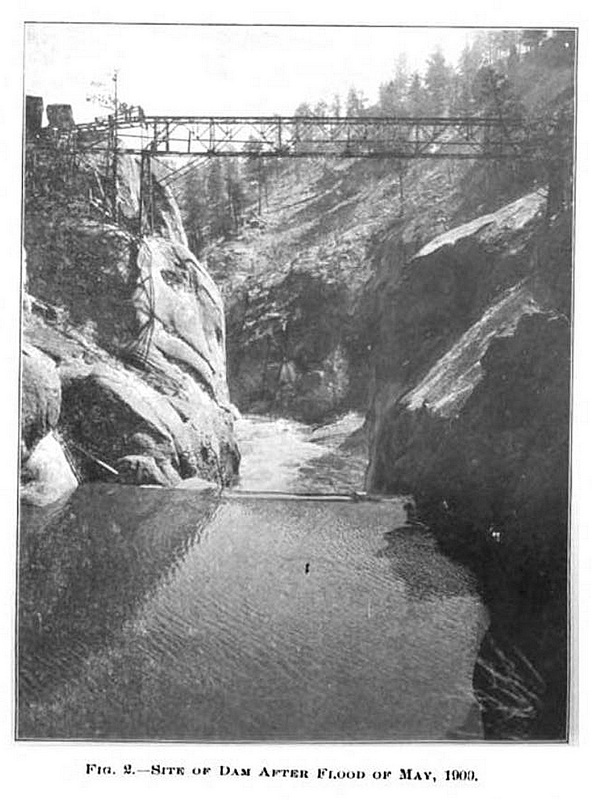 Cheesman was built in a remote canyon with steep sides to ensure little surface runoff and relatively clean water in the reservoir. From the time it was built the reservoir was fenced off to discourage human or large animal intrusions. It is still a difficult place to see. 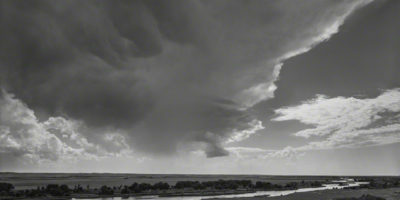 Denver Water does not allow photographs of the dam and it is off limits to casual visitors. 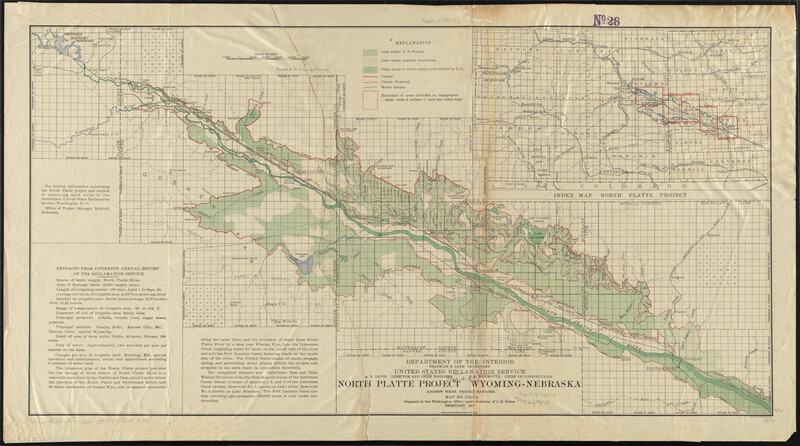 The North Platte Project is the official name of the USRS’s (now U.S. Bureau of Reclamation) project that included building Pathfinder Dam. But from the beginning it included much more than just the dam and reservoir, encompassing downstream diversion dams, canals and irrigated crop fields.  During Pathfinder’s construction and for decades after, work progressed on building the infrastructure that waters 360,000 acres of land along 111 miles of the river valley from Guernsey, Wyoming to Bridgeport, Nebraska. The canals and irrigation systems made crop agriculture possible in that arid region and provided a way of life for many, including the Germans from Russia and Mexican-American immigrants who came to work in the bean and sugar beet fields and ended up staying. 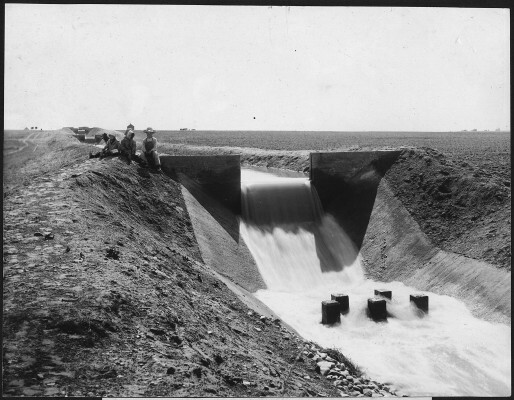 Dutch Flats, Irrigation Under the North Platte Project. Department of the Interior. Bureau of Reclamation. Engineering and Research Center.